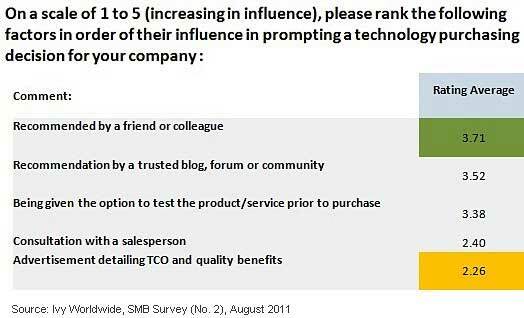 Though word-of-mouth (WOM) recommendations still have the greatest influence on purchasing decisions among small and medium-sized business (SMB) owners, online forums and blogs play a huge role in the process, too—and a more influential one than advertisements or consultations with salespeople, according to a new survey from Ivy Worldwide. Asked to rate the importance of various factors on technology purchase decisions, surveyed SMB owners and purchasers cite recommendations from friends and colleagues as the most influential (rating it a 3.71 on a scale of 1 to 5), followed by blogs and online forums (3.52) and optional trial periods of products/services (3.38). Among SMBs, consultations with salespeople (2.40) and advertising (2.26) are less influential to the purchase decision. Below, additional findings from a survey of 1,000 SMBs worldwide, employing fewer than 500 people.